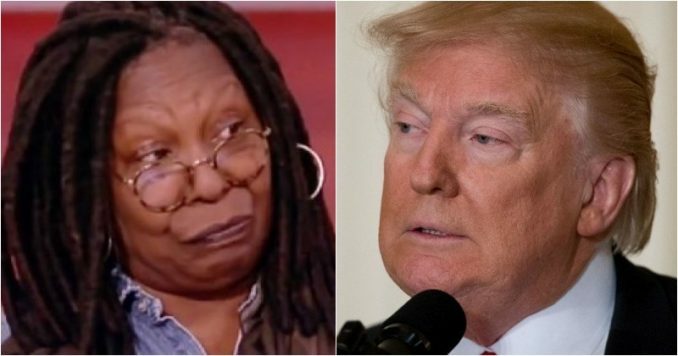 Whoopi Goldberg was bubbling with excitement on “The View” this morning as she led a discussion about a recent report which claims the FBI opened a counter-intelligence operation into President Donald Trump. “According to the New York Times, the FBI were so worried [Trump] could be working as an agent for [Russia] they opened up an investigation into him,” Goldberg said laughing. Well, the 63-year-old comedian immediately got destroyed. You’ll love this. Whoopi Goldberg and the shrews of “The View” were giddy over a New York Times article that came out a couple days ago, titled: “F.B.I. Opened Inquiry Into Whether Trump Was Secretly Working on Behalf of Russia.” You see, the only news the leftists have listened to about the bogus Trump-Russia collusion connection has to do with Robert Mueller. Now, the truth is starting to come out, and the leftist media is scrambling to get ahead of the real corruption that went on, namely, that the FBI and CIA opened up illegal investigations into Trump hoping to oust him. Most Trump supporters are aware that the Obama-led FBI was spying on Trump illegally. The deep state rats are now trying like hell to cover that up. That’s where useful idiots like the shrews of “The View” come in handy to spread the fake news. “According to the New York Times, the FBI were so worried [Trump] could be working as an agent for [Russia] they opened up an investigation into him,” Whoopi said, dripping with sarcasm. “He even physically took the translators notes of his talks with Putin in Hamburg, why I think my new nickname for him will be ‘Hamburgerler,”‘ chuckled Goldberg. Whoopi’s making no sense. She is talking about the big nothing-burger article the Washington Post came out with which reported, “Trump went to extraordinary lengths to conceal details of his conversations with Russian President Vladi­mir Putin,” telling his translator not to repeat what was said. So what? How is this even a story? The president has a right to keep his private conversations with foreign leaders off the record. Hostin answered, “A counter-intelligence investigation is to determine whether or not the acting, sitting President of the United States is a foreign spy for a foreign power. That floored me!” The shrews went on to discuss how they are convinced Trump is a Russian agent because well, the New York Times says so. Immediately, Goldberg and her cohorts got destroyed. The shrews of “The View” are basing the accusation that Trump is a Russian spy on that New York Times article. But, the NYT article is false, and we can prove it. “In the days after President Trump fired James B. Comey as F.B.I. director, law enforcement officials became so concerned by the president’s behavior that they began investigating whether he had been working on behalf of Russia against American interests, according to former law enforcement officials and others familiar with the investigation,” reports the New York Times. Let’s remember the FBI cannot just randomly open up a counter-intel investigation on any American citizen without just cause. Add that the American citizen who the FBI is spying on is the duly elected President of the United States, well, they better have an outstanding reason to do so. So, according to the New York Times, who says they are getting this vital information from “former law enforcement officials and others familiar with the investigation,” the big trigger that caused them to spy on Trump was his behavior when he fired James Comey. That’s what they are claiming. Except, according to James Comey, who testified under oath, the investigation into Trump started weeks before he was fired. “FBI Director James Comey outlined the specifics of when the counterintelligence operation began during his March 20, 2017 testimony. Pay close attention. FBI Director James Comey -together with NSA head Admiral Mike Rogers- testified to Congress specifically about the timing and notification,” reported the Conservative Treehouse. Now, how can the impetus of the counter-intel investigation into the duly elected president be the firing of Comey, when Comey himself testifies on March 20, 2017, that Congress was “briefed recently” of the on-going Trump investigation, and he wasn’t fired until May 9th, 2017. The entire truth is the Obama-led FBI under that deep state rat James Comey started the bogus investigations into Trump well before he was president. We know the four FISA applications to spy on Trump associate Carter Page happened between July-October 2016, even the anti-Trump Washington Post has admitted it. But now the deep state rats who are linked to the illegal spying are freaking out knowing they can’t hide from the truth forever. Those heavily involved are James Comey, former CIA Director John Brennan, Hillary Clinton, Barack Obama, and all of their underlings. That’s why the New York Times is getting their information from “former law enforcement officials and others familiar with the investigation.” You can bet your life it’s Comey, Brennan, and the rest of the cabal planting this fake news. And Whoopi Goldberg, Joy Behar and the rest of the shrews are the useful idiots blasting it to their audience. The really good news is the cabal is desperate. That’s why it’s so vital We the People fight back against the cabal and their mouthpieces on “The View” by getting the truth to all our family and friends. The deep state rats will scatter when the light of truth shines brightly on them.